In late 2006, The Syndicate signed a book deal with Avari Press. Avari was a smaller publishing company that specializes in Fantasy novels. They approached us about doing a book documenting the history of the guild. We accepted the challenge and began writing the book. Below you will find a sample of the cover art for the book. Avari Press is pleased to announce that it will publish a non-fiction work about the history of The Syndicate, the premier online gaming guild for over a decade in such games as Everquest, Ultima Online, and World of Warcraft. “This book is not only a history of online gaming and one of its most important institutions, it is also the record of the birth of a new form of social organization and interaction,” said editor Stephen M. Carey, Ph.D., professor of Medieval Studies at Georgia State University. Established in early 1996 by guildmaster Sean Stalzer, The Syndicate is among the oldest online guilds and, by many measures, the most successful in history. For many millions of players worldwide, guilds have become an integral part of the technological phenomenon of online fantasy role-playing games. The Syndicate has been a preeminent force in these games, and its influence is evident in many corners of the gaming world. “We were interested in publishing the first book ever written about an online guild, and it was obvious from the very beginning that we would approach The Syndicate for this project,” said Anthony N. Verrecchia, President and Founder of Avari Press. “Without giving away all their secrets, this book explains how they have been able to achieve their success not only in the game but in creating such an organized community. According to Stalzer, who is known to thousands of online gamers as “Dragons,” this book will appeal to many groups of people. “Whether the reader is an online gamer or someone who enjoys fantasy novels, this book has something for everyone. Among other things, there are fantasy stories that weave exciting tales and share the lore of our guild. Throughout its history, the Syndicate has been instrumental in beta testing dozens of games, and has worked very closely with developers, who often seek their advice. In addition, the guild has assisted in the designing of manuals for one of the largest publishers of gaming guides. 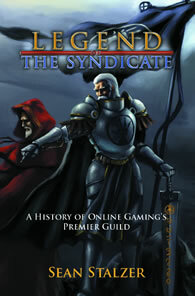 The Legend of the Syndicate: A History of Online Gaming’s Premier Guild, as the book is tentatively titled, will be released in the summer of 2007. Avari Press, based in Lancaster, Pa., exclusively publishes fiction and non-fiction works with fantasy or medieval themes. The company seeks to publish a literary class of “high fantasy,” as the genre is often described, in which stories are often epic in scope and contain elements such as elves, magic, wizards, and quests of good vs. evil. For further information, visit Avari Press’s Web site at www.avaripress.com.